Answers to some questions are obvious -- or obviously missing. Health tech and service providers want to speak – at least a little. Alexa has the answer to ‘Where’s the Nearest Hospital” but sends you to WebMD for how to treat a sunburn. Consumer healthcare literacy concerns (“what’s a formulary?”) led insurer Cigna in March 2018 to launch Answers by Cigna. Need first aid guidance about dealing with a fever? There’s Mayo Clinic First Aid Skill. Ask questions to Google Assistant -- much like Apple’s Siri, it shows both the promise and weakness of current offerings. The dilemma - to provide an answer to a question that exceeds (Google’s) 29-word brevity for the software’s spoken response. One of the critiques of WebMD’s Alexa skill – it didn’t understand drug names. Healthcare systems offer voice-enabled interfaces – as experiments. KidsMD, launched in 2016, has been a pioneer in use of Voice First health offerings – offering ‘trusted pediatric content.’ For other providers, asking for the location of the nearest urgent care facility – especially if you’re out of town – may make some sense. 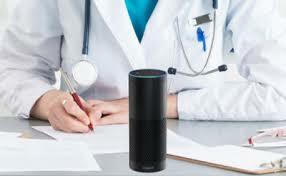 But see Independent Health’s Alexa skill – does asking about your deductible make any sense? Your particular cost to visit an ER? As some have said, Voice First does not mean Voice only – and a 29-word response, well, for some questions, the less said, the better. Home health care – may be the best healthcare fit for Voice First. Like Children’s Hospital, Libertana Home Health Care saw the potential and launched a home health solution with Orbita in 2017 – with reminders about schedules, medications, and access to caregivers. LifePod recently announced a partnership with Commonwealth Care Alliance to provide home health support for medication adherence and care plans. And then there’s Amazon -- with a team focused on health and wellness – creating buzz and some concern about a possible home health hub – not yet HIPAA compliant. But is there anyone who thinks that Amazon (or Google or even Apple) won’t overcome current barriers? NOTE: Maybe I will see you in Boston at The Voice of Healthcare Summit on August 7!